Does the idea of traveling the world while keeping a luxurious superyacht in perfect condition sound like a dream come true? Cotton Crews has a range of permanent, temporary and rotational bosun and deckhand jobs – here’s how to find one with your name on it. You can find all of our deckhand and bosun jobs on our website, or for those who prefer to search on-the-move there is now the Cotton Crew Jobs app, available on Apple or Android. Apply to your next role anytime, anywhere by simply downloading the app, creating your account and scrolling through our range of opportunities. Remember to hit ‘Available’ once you’re ready to make your profile visible to Captains in your area. Our app uses your location, skills and experience to match you up with the most relevant positions, meaning you don’t have to scroll through countless job roles before finding the right one. It also connects you with hiring managers at any time of the day, giving it the edge over traditional means of job hunting like dockwalking or Facebook. Cotton Crews’ range of private, charter and rotation yacht deckhand jobs are updated every day. What’s more, our luxury yacht crew agency is based near Fort Lauderdale, FL, meaning we are in prime position to host crew events and meet with new candidates. Our yacht deckhand jobs typically start in South FL, New England, the Caribbean or the Med, but they can take you anywhere in the world. If you’ve ever dreamt of exploring Fiji’s lush rainforests, hopping between black-sand beaches on the Windward Islands or traversing the stunning Norweigan Fjords, our deckhand and bosun jobs are for you. We also cater to all experience levels and boat sizes, from 20 to 80+ meters. Yacht deckhand jobs are a great place from which to work your way up in the yachting industry, leading to bosun jobs (meaning an increased bosun salary!) which can then progress into an officer role with the right training. All the while, you’ll be making friends for life, learning valuable life skills that will help you in whatever you do, and spending your downtime in some seriously cool vacation hotspots. Yes it will be a hard day’s work, ensuring the deck and general exterior of the vessel is kept spotless and sparkling at all times, but the rewards are worth it. Did someone say dream job? 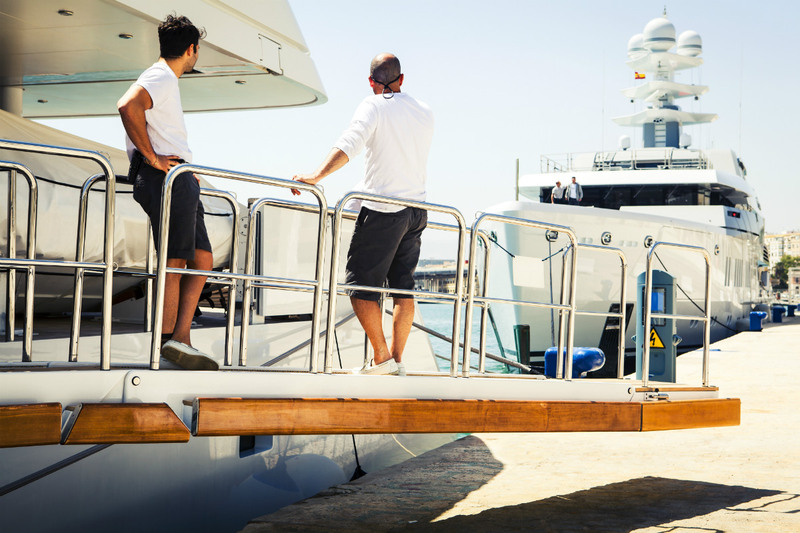 We know that when you’re first entering the yachting industry it can seem daunting – from all the superyacht job myths flying around to simply not knowing how to get a foot in the door. However, we’re here to tell you that it doesn’t have to be that way! With countless years of experience in the yachting industry, our friendly team has all the answers to your questions. From how to search for day work to how to make a stand-out yachting CV, we’re determined to help you get the deckhand jobs of your dreams. We also offer crew housing, providing you with a safe, clean and budget-friendly place to stay for the days you spend looking for deckhand jobs in FL. Let Cotton Crews be your guide to #superyachtlife. Checking into the app at least once a day is one of the quickest and easiest ways to push your profile to the top of the list for hiring managers, as Cotton Crew Jobs recognizes how often you log in and factors this in when advertising your availability. This will also mean that you are able to view new deckhand and bosun jobs as soon as they added – a definite bonus that’s sure to put you ahead of the pack! Boost your profile by adding shining references from previous positions, whether that is a company ashore or a yacht Captain. Get them to add star ratings to make it even easier for those hiring to understand how amazing you are. You can also add photos to your portfolio demonstrating any special skills you have – perhaps you have a picture of yourself driving a tender on vacation – or showing your friendly, smiling face. Yacht deckhand jobs and bosun jobs require someone who is full of energy – happy to work long hours doing physically-demanding work, while still being guest-facing. So, make sure you talk about positions where you have shown your dedication and enthusiasm, alongside your ability to quickly pick up new tasks. Those looking for bosun jobs will also want to show their leadership abilities and communication skills.